Climbing a granite crack to reach a view of the Lost Creek drainage, I exclaimed Wow! when I saw this perfect granite ball sitting on the granite bench. Lost Creek, home to the Tarryall, Kenosha, and Platte River Ranges, is a Colorado anomaly, the granite spires, domes, and twisted rock are the 'Yosemite of Colorado' and unique in the Rockies. This area is accessed via the Goose Creek trail. 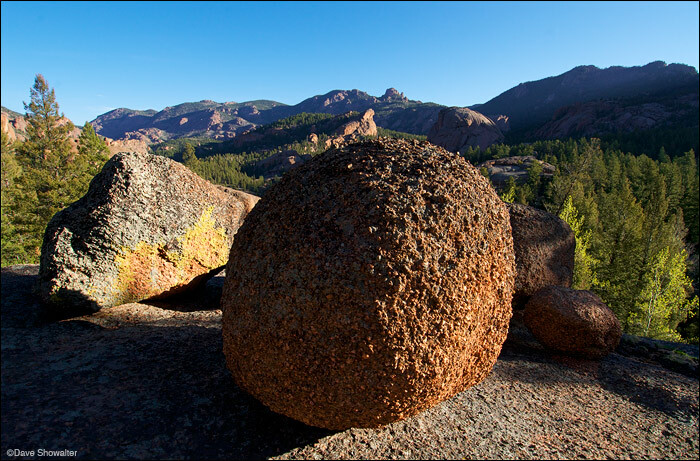 Itching to get out over the Memorial Day weekend, we set out for the Lost Creek Wilderness, a wonderland of granite sprires, domes, and three mountain ranges reaching as high as 12,000 feet. It’s a popular early season spot when the higher mounatins are still buried under heavy snow, often getting more snow at the end of May. Our out and back trip from the Goose Creek trailhead was bluebird, and our camp in ponderosa forest rewarded us with the wonder of silence. Posted in Colorado Mountains on May 29, 2013 by Dave Showalter. ← Previous: "NatGeo Newswatch with LightHawk"
Thanks for a wonderful three-day backpack Walt! I had a “ball” with you and can’t wait to go back and do the loop. Me too, can’t wait for the next adventure. Other than the tick in the hat scare, no drama, just pure fun. Relaxing? Hmmmm…gotta work on that one. Hope you saw Harmonica Arch. It’s a very special place. No, we didn’t get there, but next time we will! We’ve nibbled at the edges of Lost Creek for years, gradually learning to love it’s rare granite beauty, and so close to home. A deeper study of Lost Creek is in order – and soon.